This is a report of a Sierra hike that began at at the Gianelli Cabin trailhead, and headed into the Emigrant Wilderness. Although I’ve been hiking in the Sierra for thirty years, I’d never backpacked north of Yosemite before. The Emigrant Wilderness is the gentlest part of the “Gentle Wilderness,” perhaps. The scenery is excellent, but the trails require somewhat less climbing. The photographs are by Ed Van Beek. For more information, see my favorite books on the Sierra Nevada. August 4: Having spent two nights in Long Barn, with a day hike to warm up, the three of us (Randy Bytwerk, Ed Van Beek, and Dan Vandersteen) headed for the Aspen Meadow Pack Station. I once sneered at those who used a packer, but at 58, I am happy to take the discomfort out of the first day, and besides, I can hike in twice as far with a daypack than I can with a full pack. I recommend the folk at Aspen Meadow, who were ready for us when we arrived at 6 a.m., and performed courteously and as promised. The cost, by the way, was $210 to have our packs taken to Upper Wire Lake (plus a reasonable tip for the packer). That didn’t strike me as enough, given the service provided, but they’ll likely have to raise that thoroughly reasonable price next year. It’s a bit over eleven miles from Gianelli Trailhead to Upper Wire Lake. The trail begins at 8640 ft. Upper Wire about 8700 ft, so one ends up about at the level one begins. There are a variety of ups and downs in the 300 – 600 foot range, with decent scenery along the way. It had been a dry winter, and it showed. There wasn’t much water right along the trail. There was some excitement at Upper Wire when we arrived. Three gentlemen had camped the previous night at the south end. One wandered off and got lost, somehow heading toward Deer Lake, where he saw a campfire and was taken in for the night. His two companions had no idea of what had become of him, and feared the worst, particularly given a history of heart trouble. That morning, one had hiked out for help while the other stayed. Mid-morning or so, the lost hiker returned, saving a search operation. Upper Wire has a lot to recommend it. There are good campsites with pleasing views. It also makes a good base camp. We had planned on spending two nights there, then moving on to Emigrant Lake, but decided that there were enough day hikes to keep us amused, with the result that we spent five nights there. August 5 :We began the day by hiking back up to the main trail, then headed for Long Lake. Long Lake is one of the numerous lakes in the Emigrant Wilderness enlarged by a rock dam at the outlet, which keeps the stream flow steadier throughout the summer. There is some controversy about them, and some are being phased out, though not this one. Long Lake is a fetching place, with several good campsites along the western shore. One happened to be occupied by an overly large group of Boy Scouts, which we kept meeting for the next three days at different points. We then headed down along the outlet stream to Deer Lake, then cross-countried up to Lower Wire Lake, and then back to camp. That route is obvious, and the country is open enough to make going astray difficult. Nonetheless, there are ducks all over the place. The Emigrant Wilderness is the most overly-ducked areas I’ve ever been in in the Sierra. The problem with ducks, of course, is that one can’t be sure if the people who made them knew what they were doing. August 6: Today turned out to be a longer hike than planned, for an embarrassing reason. We began by heading over to Buck Lakes, which are definitely worth the visit. We followed them south, noting good camp sites at Upper Buck, and a few at Lower Buck. We then followed the trail south, and along Wood Lake, one of the more unusual lakes I’ve encountered in the Sierra. It is very long, but quite narrow, with water lilies. We took the easy cross-country route over to Red Can Lake, where we encountered our troop of Boy Scouts happily fishing away. We bushwhacked over to Leighton and Karl Lakes, then back down to the western side of Wood Lake. That’s where it gets embarrassing. We got to the trail junction and followed the arrow pointing toward Deer Lake. Except it was the trail heading down Buck Creek to Crabtee trailhead. Now, we really should have noticed that we were heading west rather than north, but we were in hiking mode, and chugged along about 1 mile before realizing that this couldn’t be right. We turned back. Looking at the trail marker, we still could not understand what was up — it sure seemed to point the way we went, and we couldn’t find anything leading off to the north. Well, after some blundering about in a general northerly direction, we found the right trail and ended up back at Upper Wire close to dusk, and rather wearier than we had expected to be. August 7: Dan and I were a bit weary, but Ed, the expedition mountain goat, was full of energy. I also managed to get a blister on my little toe, something I usually avoid by using toe separators from FootSmart (I recommend them for those with a similar problem). Dan and hiked down to Lower Wire Lake, climbing the dome at the south end along the way. Ed, meanwhile, headed to Lower Relief Valley, passing through Upper Relief Valley, which he recommends. Along the way, he snapped a picture of some of the cows that one encounters, perhaps a little too often, in the Emigrant. Somehow, cows seem in place in the Alps, but not the Sierra. He also found this remnant of an 1853 wagon on display. While Ed was off, one of the wilderness rangers dropped by, who happened to be a student at Oregon State University, where my son is currently a Ph.D. student. And that troop of Boy Scouts showed up at Upper Wire. They were well behaved, with a good group of leaders. August 8: I was a little worried about my toe, so I stayed in camp for the day while Dan and Ed headed off to Granite Dome. I surely missed something. The cross country route was a little more challenging than they expected, but the view was worth the effort. I regretted not joining them — but the hike out was definitely easier as a result. I spend a relaxed day on the domes in the area, and did some reading. August 9: It would be possible to hike out from Upper Wire in a day, but I’m slower as I age, so we headed for Y Meadow Lake as a way station. It’s another rock dammed lake, with some good camping spots. After setting up camp, we made the easy cross country trip to Granite Lake, definitely worth the short hike. It was surprisingly settled, given that it is off trail (though easily reached). We climbed a bit and hiked around the lake. If you’re planning on camping in the area, it’s worth the short hop over to Granite. August 10: An easy hike out got us to Gianelli and our car. We headed back to San Francisco for a relaxing evening before catching our flight back to Michigan. 1. I’d not been in the area before, and was surprised at the lack of stores. Past Sonora, there doesn’t seem to be a good sporting goods store. We ended up driving back to Sonora from Long Barn to find Bluet propane canisters. We had no luck finding them elsewhere — and we tried every shop we found. 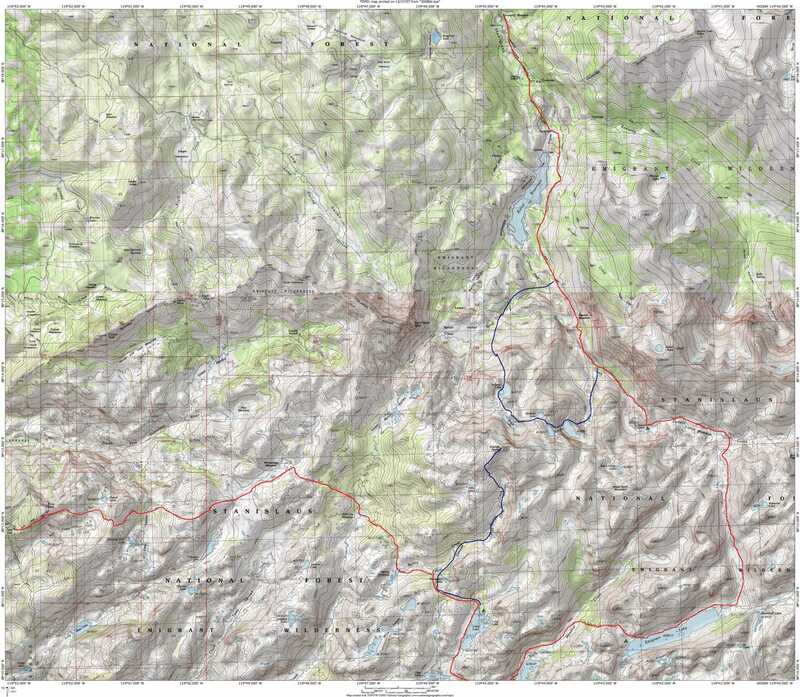 Also, the ranger station didn’t have the Tom Harrison map of the Emigrant Wilderness. If you are not familiar with his maps, remedy that situation. Get one before you leave. 2.Watch that trail junction at the western end of Wood Lake. I’m still not sure how we went wrong, but we sure did. Two options this time. The choice will depend on the participants’ level of energy (and affection for campfires). The first option is to use the Dusy Basin, on the far side of Bishop Pass, as a base camp. This is a high area (we’d be camped at around 11,400 ft.). There are enough easy peaks and interesting dayhike to keep us occupied for perhaps four nights. We’d take a detour to some interesting lakes on the way out. There are no campfires allowed anywhere in this itinerary. The second option is the Emigrant Wilderness, a compact area north of Yosemite. I’ve never been there. It is a bit more populated, but is by all reports a lovely area (and we could camp at elevations permitting fires). This hike has no major up segments. It drops several thousand feet on the last day. Both options are outlined below, the alternate in green. We’ll fly into Reno or Las Vegas. I’m including two dates, a week apart — as usual, timing will depend on the 2007-2008 Sierra snowfall. August 2/9: Fly from Grand Rapids to Reno or Las Vegas. Night in Bishop. Alternate: Fly to Reno, drive to Pinecrest. August 3/10: Hike in. 7 miles. Our gear will be packed in to the Dusy Basin by the Rainbow Pack Station. Night in Dusy Basin (around 11,400. No fires). Alternate: Hike in from the trailhead (8650 ft.) about twelve miles to Long Lake (8700). Our gear will be packed in by the Aspen Meadows Pack Station. The trail has a bunch of ups and downs, but none of them grueling. August 4/11: General exploring and scrambling about the area. Night in Dusy Basin. August 5/12: Climb Geraud Peak (12, 585 ft.). Night in Dusy Basin. Alternate: Climb Granite Dome. Night at Long Lake. August 6/13: Head up Knapsack Pass, either climbing Columbine Peak or heading to Barrett Lakes. Night in Dusy Basin. Alternate: Hike 7.5 miles to Emigrant Lake (8800 feet). Again, some ups and downs, but nothing major. August 7/14: Hike over Bishop Pass to Ruwau Lake. Night at Ruwau Lake. Alternate: Depending on energy levels, we’ll either camp at Summit Creek (about 6.5 miles), or do a little cross-countrying to Lewis Lakes. August 8/15: Climb Chocolate Peak (easy). Night at Ruwau Lake. Alternate: Layover day as needed. August 9/16: Hike out, drive to airport. Celebratory dinner.